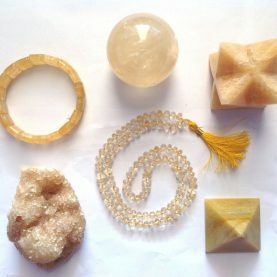 Healing Properties This collection comprises of Citrine and Calcite stones. They bring abundance in all forms. You can wear them, keep them in your home and work space. “So long as you say "I am". there is bound to be fear, but once you say and feel "I am GOD", you get unconquerable strength.” * Delivery within 3-5 business days. Healing Properties Use this collection to stay in the awareness of your truth, to uplift yourself and others. 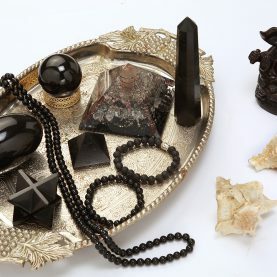 This collection comprises of the Smokey Quartz crystals. You can wear, meditate, and fill every aspect of your daily life with the vibration of an awareness of oneness and unity. “I am the Atma, silence is my breath, I am the Atma through life and through death, I Am …I simply Am.” * Delivery within 3-5 business days. 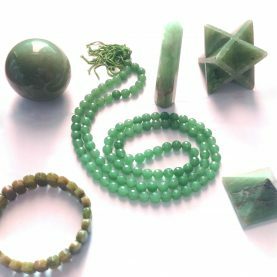 Healing Properties The collection comprises of Green Aventurine and Green Jade stones. Use these stones to heal your body and mind or in your healing practice. You may wear the crystals, keep them near you, place them under your pillow, or direct the energy towards a body part. “Wherever you may go, the Lord is always behind you. Wherever your faith meets divine Love, there is a cure.” * Delivery within 3-5 business days. Healing Properties The love collection comprises of the Rose Quartz stone. This stone helps to raise your vibration to that of unconditional love for yourself and others. 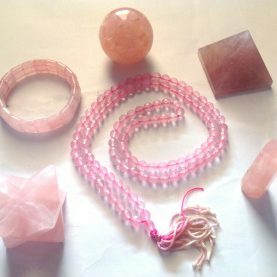 You can wear the crystals, meditate with them, keep in your bedroom, in your kitchen, on the children’s bedside table and anywhere you feel the need for this divine Devic love. “Prema (Divine Love) is God, God is Prema. Prema has no trace of selfishness; it is not bound by motives. Prema is the crucial support, for it is the very breath, the sole purpose of life.” * Delivery within 3-5 business days. 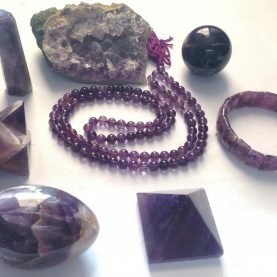 Healing Properties Take your meditation to a higher level with this collection of Amethyst stones. Fill your life with the vibration of peace, contentment, and balance. Place the crystals in your altar, meditate with them, and wear them. “There are two roads to fulfillment: prayer and meditation. Prayer makes you a supplicant at the feet of God. Meditation (dhyana) induces God to come down to you and inspires you to raise yourselves to Him; it tends to make you come together, not place one in a lower level and the other on a higher." * Delivery within 3-5 business days. Crystals in different forms, have different uses. Forms include Spheres, Towers, Merkabahs, Japamalas, Bracelets, Shivalingams, Clusters and Pyramids. 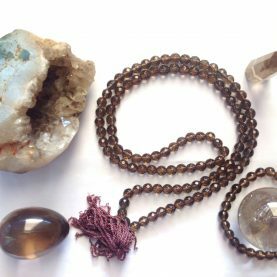 You can surround yourself with the vibration of the stone all the time by keeping crystal ‘collections’ with you. “With God as your anchor, know that you are safe …know that you are protected.” Surround yourself with the energy of protection of these strong stones like Obsidian and Black Tourmaline. Protect yourself, your home, and work from chaos and craziness. You can wear this stone, keep it in your car any other space that needs uplifting protective energy. * Delivery within 3-5 business days.